Joyful. Compassionate. Courageous. Persistent. Spirited. Devoted. Kind. This is the kind of heart you will develop at Loyola. A heart that you also find in your peers, in your professors, and in Loyola's 62,000 alumni. A heart that makes you a forever Greyhound. With just over 4,000 undergraduates and a 12:1 student-to-faculty ratio, Loyola University Maryland is big enough to be rich in opportunity and small enough for these opportunities to be accessible. 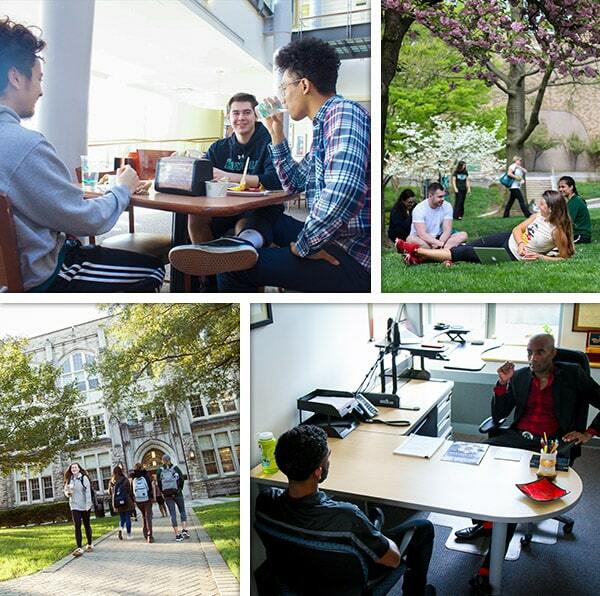 Loyola makes it easy to embrace new challenges, feel comfortable taking risks, and connect to the experiences and resources you need to develop as a learner, leader, citizen, and professional. Loyola students feel called and confident in trying new activities, sharing their talents, asking bold questions, and expressing ideas and opinions others might find controversial. We cultivate an open, supportive, and accepting environment here, because such an environment is fundamental to our identity as a Jesuit institution. Only in a community like ours can students learn authentic lessons about who they are and the world they live in, open up new and unexpected pathways for themselves, and fully understand and experience what it means to be Jesuit educated. Greyhound pride reaches new levels for the annual men’s lacrosse matchup against long-time local rival Johns Hopkins. Every fall, students are welcomed back to campus with live music, games, a beach volleyball tournament, a casino night, and more. Loyola men’s basketball has faced off against Mount Saint Mary’s for more than a century. Loyola celebrates our liberal arts heritage with an annual lecture series and performances surrounding a selected work. Meet in Boulder Garden Café for late night pancakes. Wake up at 5:30 a.m. to buy tickets—and they might already be sold out. The chapel is standing-room only at this seasonal service featuring candlelightand Christmas carols. Seniors and alumni enjoy food and live music together every January. Students flock to the Quad for live music, carnival rides, and food during Loyola’s annual springtime festival.